The TABBERT bestseller VIVALDI has a new interior design – and can thus score points across the board. 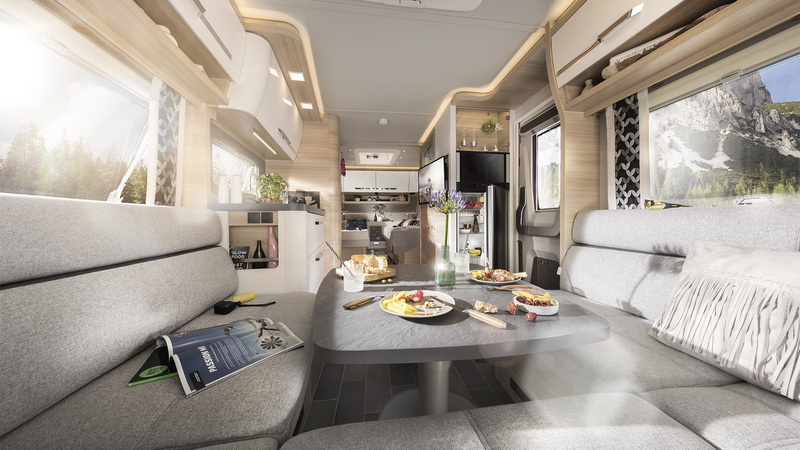 In addition to design highlights such as the lighting concept, bright colours and the exclusive choice of materials, the VIVALDI shows off its best side when it comes to its layout. Generous seating and sleeping facilities, a fully equipped bathroom and plenty of storage space make the VIVALDI a real layout phenomenon. “It is not for nothing that VIVALDI calls itself the first mobile flat. The large sitting area invites you to eat together and while away the evening after a long day. Equipped with high-quality fittings, the kitchen is designed to save space – and yet still provides lots of storage thanks to wall units and a pantry pull-out. The separate toilet and shower provide more flexibility in the bathroom. Free lines of sight and the associated freedom of movement are typical of the layout. The entire centre of the caravan is designed for free movement and offers excellent access to every area – including through the new wide entrance door.